Most of us are familiar with certain websites that we are drawn to for one reason or another. Perhaps we find these websites visually appealing, while others are optimized for accessing information easily. There are a myriad of reasons why we feel differently about each website, and even though it seems everyone has their own tastes and preferences there is evidence to suggest that we are all programmed to digest websites in very similar ways. The research paper shows that when a user is visiting a website, there is a very high correlation between where their mouse cursor is placed and where they choose to click. Below is an image that gives us visual evidence of this research. The right image is where user's cursors were placed, and the left image is where the most 'clicks' were made. "In an eye-tracking study, we showed that cursor position is closely related to eye gaze. 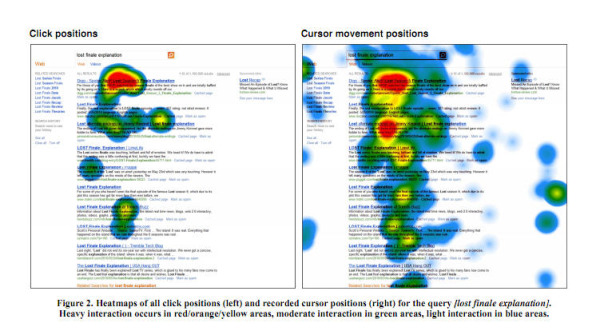 We were able to use cursor movements to estimate search result relevance..."
Huang continues by saying that marketers may come to find this type of tracking useful since the cursor movements are very closely linked to the eyepath of the website visitor. If marketers were able to take advantage of this technology, they would be able to track what parts of their website(s) were being looked at. By the same token, they would also know what part of the pages were being ignored. This method of tracking users' interaction with websites may very well be a viable source of information and data as we move forward. Marketers would be able use the information to best optimize websites, and thus improve site visibility and increase lead conversion.